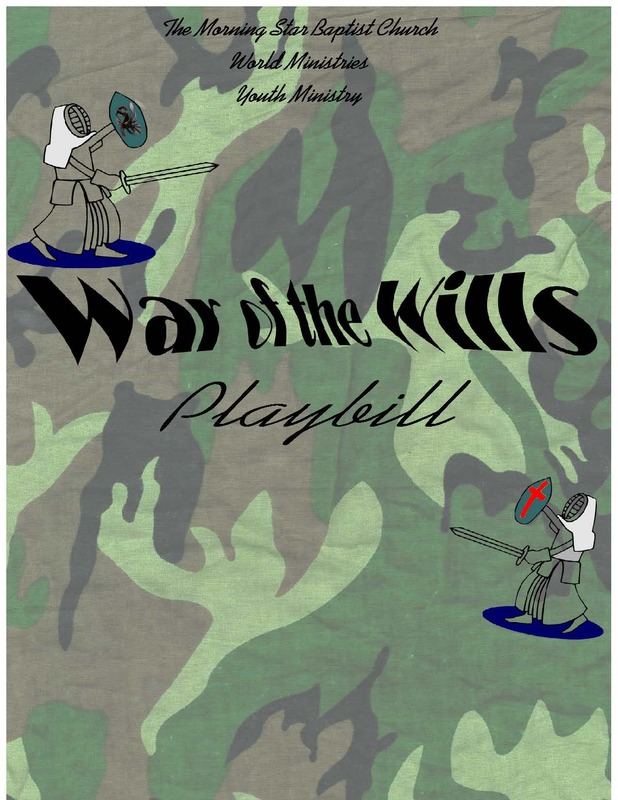 "War of the Wills" Our first church production! A reporter and her cameraman cover a breakout of violence around a church. As they interview various refugees from the war zone, they find out that it is a church war. A titanic battle of the wills is being waged between members who disagree on trivial details. Neither side wins, and the church splits in two. A defeated and wounded party of survivors, led by the pastor, are inspired by a child to return and rebuild what has been lost. 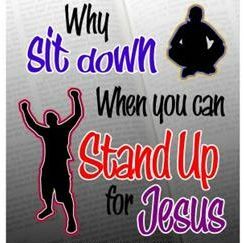 "Why sit down when you can stand up for Jesus" was ministered in 2009. Th scene is set on a game-show, "Who wants to be a millionaire" and there are 5 contestants eagerly awaiting their opportunity to win a dollar amount that they think will change their life; but they don't know is that they will walk away from the game show with so much more. This play will look into the lives of these five contestants and leave you asking the question, "Why sit down when you can stand up for Jesus". 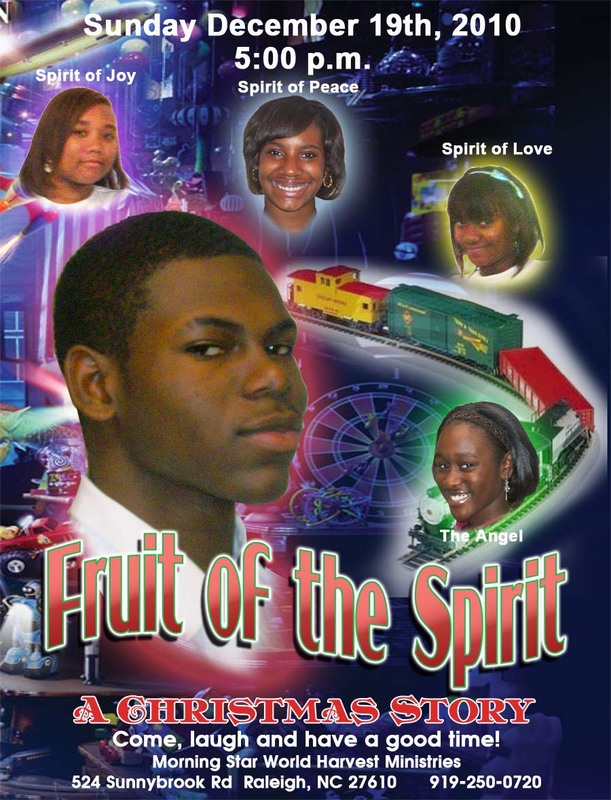 "Fruit of the Spirit" A production about Damon Tisdale the local toy store owner in a small town with one faithful employee, Brenda Wright. While most people are caught up in he true Christmas spirit, Damon Tisdale is heartless, cold and only has one goal and that is to make money at any cost. Damon's nephew Curtis Tisdale is a church going man of God who is always encouraging his uncle to come to church to be delivered and set free but Mr. Tisdale is visited by an angel that reveals to him that he will be visited by three of the nine fruit of the spirit. Mr. Tisdale has an unforgettable journey that will change his life forever or will it? "Joyful Christmas a Special Gift" The Christ in Christmas takes place at the Hands of Glory hair and cuts salon. The owner, Christine Kelly, has to make a hard decision regarding the status of the salon and the decision must be made before the Christmas holiday. Christine has a strong belief in the Lord and always encourages her employees to seek the Lord but she is having a hard time with the choice she must make. The decision Christine makes has a huge impact on her employees and things suddenly begin to change but is there enough time?